But some models are more popular than others like N72, N73, N80, N81, N95 and NSeries. 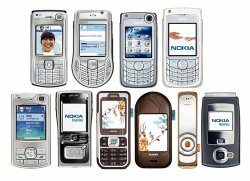 To fix some problems ( eg : get infected with virus, some system errors or installed too much software on it), many users asking me how to format Nokia NSeries Phone. 1. Turn off the mobile Phone. 2. Press and Hold the following three buttons: Green Call Answer button + the “*” button + number “3″ button. 3. While holding these buttons, press the power button and switch on the phone. 4. When the message ‘Formatting’ appears on the screen, release all of the buttons. 3. Enter Default lock code is 12345. 4. While holding these buttons, press the power button and switch on the phone. 5. Wait for message ‘Formatting’ to appear on the screen and release all keys once you see that message. 2. Hold down *#7780# button.